You might look at Deco Diamonds by Just For The Win, and instantly think of the Great Gatsby. We don’t really blame you, as everything from the background music, to the decorations, the fonts and the theme of the slot are reminiscent of the 1920s. However, it is not Great Gatsby that you should be thinking of, but much rather the Art Deco Movement. 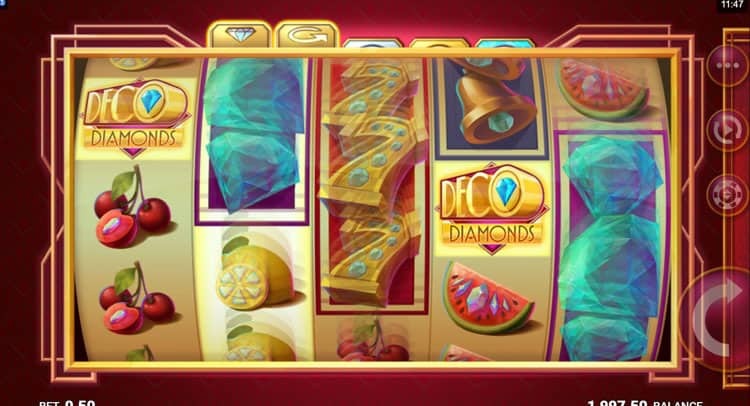 Deco Diamonds has five reels and nine pay lines. The min and max bet range from 0.10 to 50 per spin. The casino game has high volatility and an RTP of 96.03%. Now back to the Art Deco Movement which took over the architecture, furniture, fashion and jewellery of the 1920s. The biggest telltale sign that Deco Diamonds follows the theme of the Deco Movement is within the name itself. Next up is the geometric shapes, music and symbols. The symbols are those of a typical fruit machine, so we have diamonds, cherries, lemons, watermelons, bells and sevens. The highest paying symbol is the Deco Diamond wild which gives 1000x the stake for five of them across a winning line. This wild works also as a bonus symbol and substitutes for all other symbols. The lower paying symbols include the watermelon, lemon, peach and cherry. Since all the lower paying symbols are covered with diamonds, none of them really look low paying, just as one would expect from an Art Deco theme. As for the music of Deco Diamonds, think of your typical roaring twenties flapper music and put that right behind this slot game. The first thing that popped into our heads when we saw the special features in Deco Diamonds was that the mechanics were similar to the ones in Hong Kong Tower by Elk. They both have more or less the same bonus wheel feature going on, with the same kind of thought behind it, either to move to the next wheel or win. The difference is that in Hong Kong Tower you win coins, and in Deco Diamonds, you win a multiplier. You can trigger this feature by landing two or more Deco Diamond wilds. This will award one free re-spin with the wilds locked in place. Any new wilds that land on the re-spin will award an additional spin until no more wilds show up, or until you have five on your reels. If you have three or more Deco Diamond symbols on your reels, you will move on to the bonus wheel round. To trigger this bonus you need to land three or more Deco Diamond wilds. Immediately after the re-spin feature plays out, the bonus round will start. Here you get to spin the Fortune Wheel. There is a total of three wheels, each holding prizes multiplied by bets in them and the arrow which gets you to the next one. Each new wheel you advance to has bigger prizes. If you manage to land five scatters on your reel in the base game, you can go directly to the last and best wheel. 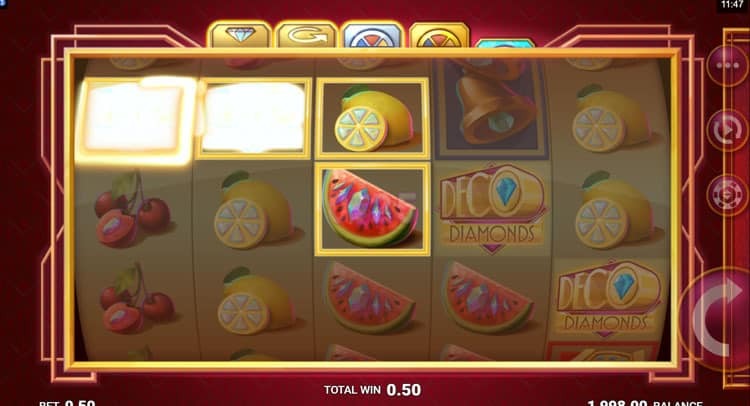 The Deco Diamonds slot combines a retro fruit machine feel with a modern look. However, as already mentioned, players and slot streamers might rightfully point out that the slot is pretty similar to the Hong Kong Tower video slot by ELK. This is due to both casino games having a similar bonus round. That being said, Deco Diamonds is much more volatile and has massive winning potential. Another thing that we liked about this slot game is the Art Deco movement theme, something which you don’t find too often within a slot game, or rather you don’t find it fitting so nicely. Since the mechanics are similar to Hong Kong Tower, we have to point out that what we did not like so much is how hard it is to get to the last wheel of the bonus round. Since you can get there with five bonus symbols, we guess it is easier to reach in Deco Diamonds.